Giant Galaxy is an advertisement-supported program that we recommend deleting from your PC right away. This program could be installed onto any Windows operating system, but it works only if you use Internet Explorer, Mozilla Firefox, and the older versions of Google Chrome browsers. The new versions of this browser automatically block this malicious adware. If that does not prove that this program is unreliable, you can read our report. We have created it after analyzing and removing Giant Galaxy. If you read this article, you will learn what kind of risks you might encounter if you do not eliminate this threat. "Ads by Giant Galaxy" and "Provided by Giant Galaxy” are the tags that might be attached to the banners and pop-ups injected by Giant Galaxy. Even though this can help you recognize which adware to remove and ads to ignore, we do not recommend relying on this to avoid all threats. First of all, other unreliable ad-supported programs could be installed onto your PC, which means that unidentified ads could show up as well. Even if you avoid all ads, you must delete Giant Galaxy and other ad-supported programs. If you do not, your virtual security could be jeopardized secretly, without any warning. Are you aware of the tracking cookies installed along with Giant Galaxy? Users rarely think twice about the tracking cookies that follow adware, potentially unwanted programs, or the sites they visit, because they are not so common. What's more, tracking cookies might be installed silently. All in all, if you do not delete Giant Galaxy-related web cookies, they will collect information about you. If this information is sold to unreliable parties associated with SuperWeb LLC (the developer), your virtual security could be targeted in other ways. Thirteen Degrees, Polished Patterns, and other ad-supported programs developed by SuperWeb require removal for the same reasons. 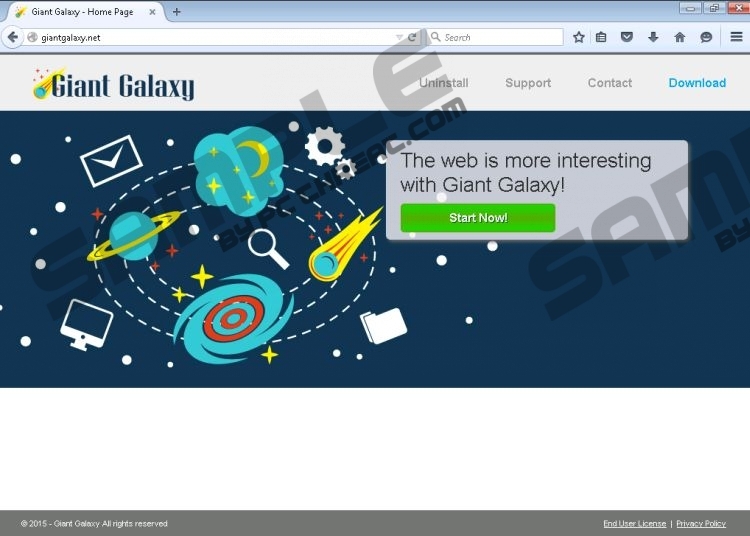 Since the installer of Giant Galaxy is not available from giantgalaxy.net, it is likely that this program will enter your PC via a software bundle. Even though it might seem very convenient to download several different programs using the same installer, we warn you that this is extremely risky. If you trust unreliable installers, it is very likely that malicious infections will be installed with Giant Galaxy. Even though we have focused on the removal of Giant Galaxy, you must not underestimate the maliciousness of other threats. We recommend deleting all unfamiliar programs installed along with this adware to avoid security threats. You can delete Giant Galaxy using our manual removal guide. Unfortunately, it is unlikely that this guide will help you remove all computer infections. What's more, your virtual security will not be much improved if you do not take protection seriously. If you understand that you should invest in a trustworthy security tool, you should install it right now. If you do, you will not need to worry about the removal of Giant Galaxy or other infections, as they will be deleted automatically. Navigate to Change or Remove Programs. Move to Programs and click Uninstall a program. Quick & tested solution for Giant Galaxy removal.